Archaster typicus, a common sea star in Indo-Pacific regions, has been a target for the ornamental trade, even though little is known about its population biology. Spatial and temporal patterns of abundance and size structure of A. typicus were studied in the Davao Gulf, the Philippines (125°42.7′E, 7°0.6′N), from February 2008 to December 2009. Specimens of A. typicus were associated with intertidal mangrove prop roots, seagrass meadows, sandy beaches, and shoals. Among prop roots, specimens were significantly smaller and had highest densities (131 ind. m−2) between November and March. High organic matter in sediment and a relatively low predation rate seemed to support juvenile life among mangroves. Size and density analyses provided evidence that individuals gradually move to seagrass, sandy habitats, and shoals as they age. Specimens were significantly larger at a shoal (maximum radius R = 81 mm). New recruits were found between August and November in both 2008 and 2009. Timing of recruitment and population size frequencies confirmed a seasonal reproductive cycle. Juveniles had relatively high growth rates (2–7 mm month−1) and may reach an R of 20–25 mm after 1 year. Growth rates of larger specimens (R > 30 mm) were generally <2 mm month−1. The activity pattern of A. typicus was related to the tidal phase and not to time of day: Specimens moved over the sediment surface during low tides and were burrowed during high tides possibly avoiding predation. This is one of the first studies to document an ontogenetic habitat shift for sea stars and provides new biological information as a basis for management of harvested A. typicus populations. Communicated by J. P. Grassle. The online version of this article (doi: 10.1007/s00227-010-1588-0) contains supplementary material, which is available to authorized users. The Indo-Pacific beach star Archaster typicus is a relatively common sea star in shallow habitats from Southeast Asia to Taiwan, western Polynesia, and Australia (Colin and Arneson 1995). Probably due to its commonness, this species is, apart from the crown-of-thorns (e.g. Pratchett et al. 2009; Bos 2010; Houk and Raubani 2010), one of the more frequently studied sea stars in the Indo-Pacific. Archaster typicus is a medium-sized sea star with a radius of 15–40 mm, but occasionally up to 70 mm (Schoppe 2000). Aggregations of A. typicus are often seen along shores, but may be completely invisible if specimens are burrowed under the sediment (Colin and Arneson 1995). In similar habitats, juvenile sea cucumbers (Echinodermata; Holothuroidea) exhibit a daily burrowing rhythm controlled by light intensity and water temperature (Mercier et al. 1999; Mercier et al. 2000). It is unknown what triggers the burrowing behavior of A. typicus, but by doing so they seem to escape predation during a certain period of the tidal phase. Populations of Archaster typicus typically inhabit intertidal sand flats (Mukai et al. 1986), but are also found in subtidal seagrass meadows up to 1 m below mean low water (Bos et al. 2008a). These observations suggest that specimens of A. typicus migrate to different habitats during ontogenetic development. 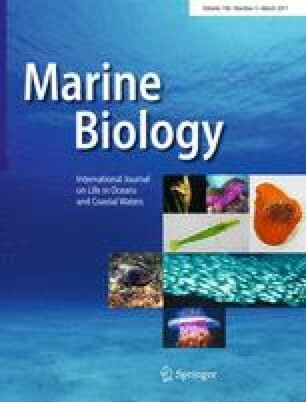 Ontogenetic shifts and ecological connectivity among tropical ecosystems are common and have been intensively studied for fish and decapods (e.g. Nagelkerken et al. 2008; Shibuno et al. 2008). However, only a few studies have documented changing habitat associations for sea stars. Scheibling and Metaxas (2010) found mangroves in Belize to be dominated by juveniles of the tropical sea star Oreaster reticulatus. In Panama, larger juveniles of the same species exclusively inhabited dense seagrass meadows (Guzman and Guevara 2002). In the Philippines, adults of another tropical sea star Protoreaster nodosus did not share habitats with juveniles (Bos et al. 2008b), which may yet be another indication that different life-stages may have varying habitat requirements. We hypothesized that specimens of A. typicus undergo an ontogenetic habitat shift with changing priority for mangrove, seagrass, and sandy habitats. The reproductive strategy of Archaster typicus, uncommon among asteroids, is characterized by a mating-like behavior during which males mount on females (Boschma 1923; Komatsu 1983; Janssen et al. 1984). In sub-tropical environments in the Northern hemisphere, mating was observed between March and August (Mukai et al. 1986; Run et al. 1988). In both studies, gonad analysis confirmed that reproduction was indeed limited to that particular season. In contrast, Janssen (1991) observed mating in April and November and hypothesized that reproduction was not limited to a particular season in the tropical seas of the Philippines. The observation of mating may not necessarily be an accurate indicator of this sea star’s reproductive season in tropical environments; Mating may occur throughout the year, whereas successful reproduction may be limited to a particular season. Regardless of mating, monthly monitoring of size distributions could be used to identify cohorts and provide insight into reproduction success. The presence of small juveniles throughout the year would confirm Janssen’s (1991) hypothesis, whereas it would be rejected if juvenile cohorts were found only once a year. In this study, we describe an ontogenetic habitat shift, determine the seasonality of the reproductive season, and provide age estimations by analyzing spatial and temporal patterns of abundance and size structure of the sea star Archaster typicus. Furthermore, we examine the burrowing behavior of the species in relation to time of day and tidal phase. To study spatial and temporal patterns of abundance and biomass as well as size structure of Archaster typicus populations in Samal Island (Fig. 1), ten systematically positioned quadrats (1 × 1 m) were sampled during every full moon (low tide at noon) between February 2008 and December 2009. Intertidal mangrove prop roots (n = 2), seagrass meadows (n = 4), and sandy beaches (n = 4) along the shore of Samal Island (0–20 cm above mean low water [MLW]) were always sampled when they emerged at low tide. High densities and small sizes of seas stars, especially among mangrove prop roots, resulted in time-consuming collections. An increase in the number of quadrats was therefore not possible, since murky water sharply reduced the number of collected specimens during incoming tides. Sea stars were collected by carefully raking the sediment by hand to assure finding small and burrowed individuals. For comparison with the three shore habitats, the A. typicus population of a nearby sandy shoal was sampled on 20 August 2009 (Fig. 1). Low sea star density forced us to use belt transects (50 × 5 m, n = 3), which were randomly positioned on the sandy sediment at low tide. All radii (ray length R) of each individual were measured from the mouth (center of the disk on the oral side) along the ambulacral groove to the tip of a ray using calipers (1 mm accuracy). The activity pattern and burrowing behavior of Archaster typicus in relation to tide and time of day were studied during a 24-h observation in intertidal seagrass and sandy habitats in Samal Island on 15–16 September 2008 (Fig. 1). The number of visible sea stars was counted hourly in 6 fixed quadrats (1 × 1 m) without disturbing the sediment. Simultaneously, sea level height was measured (5 cm accuracy), and the times of sunset and sunrise were recorded. Growth of Archaster typicus was studied in two enclosures from January 2008 to August 2009. Each enclosure (1 × 1 × 0.65 m) consisted of a PVC-pipe frame with netting material (5-mm mesh). Both enclosures were dug 0.2 m into the natural sandy sediment at 0.1 m below MLW and were additionally anchored with metal bars at each corner. A maximum of five individuals per enclosure was studied not exceeding natural densities. Growth of juveniles (mean R < 15 mm) was studied in a container (0.40 × 0.25 × 0.15 m) with 50 mm of sediment between August 2008 and April 2009. This container was put into a 2-mm mesh bag to prevent sea star escape and placed in one of the enclosures. Small sea stars (mean R < 15 mm; n = 16) were measured every two weeks and large specimens (n = 12) once every month (all rays at 1-mm accuracy). Photographs were taken to identify individual specimens. No mortality occurred. Damaged specimens were excluded from further analysis. The growth experiment was ended in August 2009 when a storm destroyed the enclosures. Sediment samples were collected in mangrove, seagrass, and sandy habitats on 5 September 2008 in order to explain habitat preferences of juvenile and adult sea stars. Ten cores per habitat (30 mm diameter, 45 mm deep) were collected and stored in a freezer. Seven cores of each habitat type were sieved over 2, 0.5-mm, and 63-μm meshes, weighed, and dried in an oven at 105°C. The three remaining cores were weighed and dried without prior sieving to determine the fraction <63 μm. The weight of the fraction <63 μm was calculated by subtracting the mean added weights of the three sieved fractions from the mean weight of the three unsieved samples. Organic matter was determined by combustion of the sediment fractions in a muffle furnace at 450°C for 5 h.
Water temperature was measured with a thermometer (0.2°C accuracy) at 3 m below MLW during each monthly sampling between February 2008 and December 2009. Water temperature in tide pools was measured between March and September 2009 to estimate the maximum water temperature exposure of Archaster typicus. Water temperature in the enclosures was measured in April and November 2008. 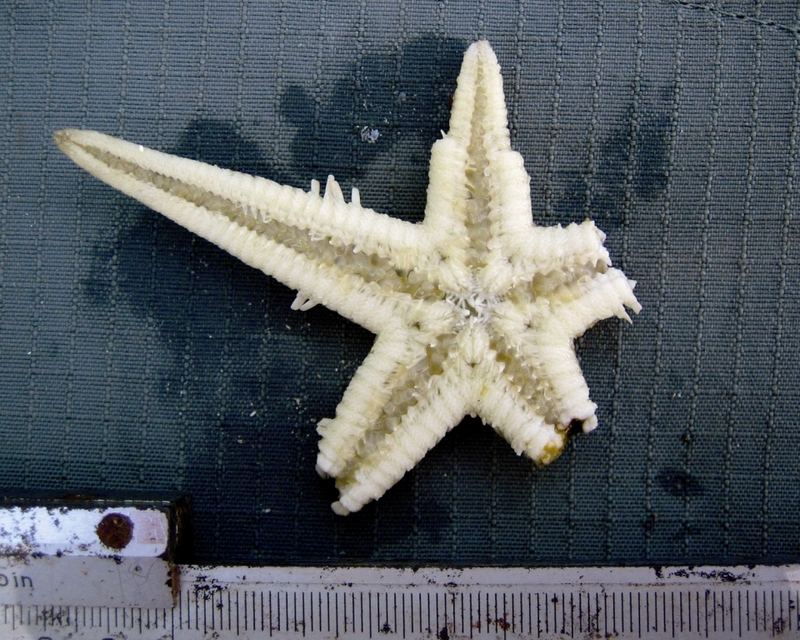 Mean R was used to determine sea star size in the growth experiment, because intact pentamerous specimens had been selected. For the natural populations, however, maximum radius (R max) was used, because a high percentage of sea stars had missing, damaged or regenerating rays. Broken rays lowered mean R and affected the size-frequency distributions. For example, a specimen with four damaged rays (S1, Supplementary materials) would appear much smaller than others in the same cohort when using mean R. In contrast, sea star biomass was calculated with mean R, because broken rays reduce an individual’s weight. The following radius-weight relationship was used: W = 0.0007 × R 2.499 (12.0 < R < 80.6 mm, n = 82, r 2 = 0.989). To study growth of a natural population, model progression analysis of the size-frequencies was performed with FiSAT II using the Bhattacharya method (Gayanilo et al. 2005). Specimens were pooled among the three habitat types per sampling date. The growth rate (G) was determined using the formula: G = (Rt 2 − Rt 1 )/(t 2 − t 1 ), where R is radius (mm), and t is sampling date. Predation was the main reason for the high numbers of sea stars with fore-shortened rays in the natural population (pers. observation). Sea stars prioritize ray regeneration above somatic growth, which may cause specimens to be small in habitats where predation is high (Diaz-Guisado et al. 2006). To explain size differences among habitats, predation rate was estimated by the number of sea stars with damaged rays. All five radii were expressed as a percentage of R max and considered damaged if <90% of R max. Predation differences among habitats were analyzed with contingency tables: four rows for habitat type and two columns for ray condition (complete or damaged). The null hypothesis, that predation is similar in all habitats, was tested with the Pearson χ 2 -test. The hypotheses that sea star density, biomass, and radius did not differ among habitats were tested with the non-parametric Kruskal–Wallis test. The use of a parametric alternative was not possible, because the assumption of variance equality was not met for original and transformed data (Levene’s test). Tamhane’s T2 post hoc test (α = 0.05), which takes unequal variances into account, was used to detect differences among individual habitats even though the habitat types defined in this study were not replicated at multiple sites. Sediment fractions of dry weight and organic matter were tested for differences among habitats with a one-way ANOVA. Post hoc analyses were done with the Tukey’s honestly significant difference test (α = 0.05). The activity of Archaster typicus highly depended on the tidal cycle (Fig. 2). Generally, 12 individuals m−2 were found on the sediment surface during low tides, whereas none were observed during high tides. More specifically, the number of visible sea stars was much higher when the sea level was <0.6 m than when it was ≥0.6 m. These results are consistent with our observations during the extensive sampling and explain why we decided to sample on each full moon when low tide was around noon. Time of day did not affect sea star behavior (Fig. 2). Sea star density was significantly different among habitats (Kruskal–Wallis, P < 0.05) over 11 months (Table 1). Post hoc analysis revealed that density was generally higher in seagrass than in sand. Additionally, density in mangroves was higher than in sand in October, November, and December 2008 and in June and March 2009 (Table 1). Mean density was generally ≤60 individuals m−2 in mangroves, but increased between November 2008 and March 2009 with a maximum of 131 individuals m−2 in November 2008 (Fig. 3). In seagrass, density was relatively unchanging with a mean of 40.9 individuals m−2. Mean density in sand was generally low (<20 individuals m−2), but slightly higher between March and July 2009 with a maximum of 69.5 individuals m−2 in April 2009 (Fig. 3). In August 2009, sea star density on the shoal was 0.05 (±0.03) individuals m−2. Post hoc analysis showed that this was significantly lower than in sand, but not significantly different from the August densities in mangrove and seagrass. Sea star biomass was significantly different among habitats (Kruskal–Wallis, P < 0.05) from August to November 2008 and in 4 months in 2009 (Table 1). Post hoc analysis revealed that in most cases, biomass was lower in sand than in seagrass. Biomass was relatively constant in mangroves and seagrass with a mean of 31.6 and 69.2 g m−2, respectively (Fig. 3). The high density in mangroves in November 2008 did not correspond with a high biomass, because most sea stars were small. Biomass in sand increased from <10 g m−2 in 2008 to a peak of 125 g m−2 in April 2009 and stayed relatively high until July 2009. After July 2009, it decreased again. In August 2009, mean biomass on the shoal was 1.14 (±0.74) g m−2. Post hoc analysis showed that this was significantly less than in seagrass, but not significantly different from the biomass in mangrove and sand. Radius R was significantly different among habitats between September 2008 and August 2009 and in November 2009 (Kruskal–Wallis, P < 0.05). Sea stars in mangroves had a significantly lower R than those in seagrass and/or sand, whereas R was not significantly different between seagrass and sand (Fig. 4). In mangroves, R increased from 9 mm in November 2008 to 20 mm in July 2009, while in seagrass and sand, R increased from ~19 to 25 mm. In mangroves, R decreased to 9 mm in August, then increased during the following 2 months, and again decreased to 17 mm in November 2009. Both decreases coincided with the appearance of new cohorts. In August 2009, sea stars on the shoal had an R of 65 mm, which was significantly greater (Kruskal–Wallis, P < 0.01) than R in all shore habitats (Fig. 4). The largest specimen with an R of 81 mm was observed on the shoal. The number of sea stars with broken rays, an indicator of predation, was significantly different among habitats (χ 2 , P < 0.01). Sea stars with broken rays were most frequently found in seagrass and sand (40 and 39%, respectively; Table 2). In the mangroves, 29% of the sea stars had broken rays, whereas on the shoal, this proportion was only 16% (Table 2). In total, 6,180 sea stars with R ranging from 2 to 46 mm were found in the shore habitats from February 2008 to December 2009 (Fig. 5). From February to July 2008, the majority of sea stars had an R > 10 mm. In August 2008, a new cohort with a mode of 10 mm and few specimens with an R of 2 mm were observed. In September 2008, these two cohorts had merged into a bimodal size-frequency distribution. In October and November 2008, a third cohort with mean radii of 5 and 8 mm, respectively, in each month was added. This cohort dominated the population until July 2009, when mean R was 24.5 mm. As in 2008, juvenile cohorts were found between August and November 2009 (Fig. 5). Modal progression analysis of the size-frequency distributions confirmed that in 2008 three and in 2009 two new cohorts were observed (Fig. 6). Growth rate of the new cohorts (R < 20 mm) ranged from 2 to 7 mm month−1, whereas growth rate of larger specimens was always <3 mm month−1 (Fig. 7). Regression analysis resulted in a significant growth function for the natural population: G = 0.427 + 5.918e−0.072R (n = 39, r 2 = 0.469, F = 15.9, P < 0.01). Although originating from the same population, enclosed sea stars grew much larger than those of the natural population and reached an R of 40–60 mm (Fig. 6). Growth rates of enclosed specimens were similar to those of the natural population, and large enclosed specimens with R > 30 mm had growth rates <3 mm month−1 (Fig. 7). However, growth rates of enclosed juveniles drastically decreased between October 2008 and March 2009 (Fig. 6) and were generally <1 mm month−1 (Fig. 7). These juveniles belonged to two batches and may have experienced disturbed growth. Regression of the growth rates of all enclosed sea stars did not result in a significant growth function, because the two juvenile batches highly affected the function (Fig. 7; dotted line). The combination of growth rates from the natural population and the enclosed specimens (excluding the juvenile batches) gave the best fit and resulted in the following growth function: G = 0.178 + 5.734e−0.048R (n = 155, r 2 = 0.497, F = 75.2, P < 0.01). After 1 year, specimens of Archaster typicus had an R of 20–25 mm (Fig. 5). The growth function (Fig. 7) suggested that specimens with an R of 60 mm were 3 years old. The <63-μm fraction of the sandy sediment was significantly less (ANOVA, P < 0.01) than in mangrove and seagrass, whereas the 63–500 μm fraction was significantly less in seagrass than in the other habitat types (Table 3). The two larger sediment fractions (0.5–2.0 mm and ≥2 mm), which constituted ~30% of the sediment in all habitats, were not significantly different among mangrove, seagrass, and sand (ANOVA, P > 0.05). The total content of organic matter was significantly higher in mangroves (ANOVA, P < 0.05) than in the other habitats (Table 3). Total organic matter reached 21.7% of total dry weight in mangroves, whereas this was 15.3 and 10.7% in seagrass and sand, respectively (Table 3). Organic matter in the 63–500 μm fraction was significantly smaller in sand, whereas organic matter of the fraction ≥2 mm was significantly larger in mangroves than in the other two habitat types (Table 3). From February 2008 to November 2009, mean monthly water temperature ranged between 28.0 and 34.0°C (Table 4). Highest water temperatures were found from May to September 2009. Water temperature in tide pools, where Archaster typicus specimens were found during low tides, reached a mean of 37°C and occasionally reached 40°C (Table 4). Mean water temperatures in the enclosures were 29.8 and 29.2°C in April and November 2008, respectively, and followed the seasonal trend in observations at 3-m depth. The sea star Archaster typicus has generally been known as an inhabitant of shallow shoreline habitats (Colin and Arneson 1995; Schoppe 2000; Bos et al. 2008a). The different life-stages of this sea star, however, inhabit a range of habitats within the shallow subtidal and intertidal zones as shown by the present study. Small juveniles were mostly found among mangrove prop roots, middle-sized sea stars in seagrass meadows, and along sandy shores, whereas large sea stars (R < 50 mm) were exclusively found on a sandy shoal. The abundance of juveniles among mangrove prop roots, shown by the significantly smaller size in this habitat type, may be the result of higher post-settlement survival than in other habitats. The importance of mangroves as nursery habitat has been described for a range of marine and estuarine species (e.g. Nagelkerken et al. 2008), where food abundance, shelter, limited predation from fish, and reduced exposure to currents are the essential advantages for juvenile life among prop roots. However, only a few studies have mentioned this ecological role of mangroves for sea stars (Guzman and Guevara 2002; Scheibling and Metaxas 2010). Post-settlement survival of A. typicus may be high among mangrove prop roots, because this habitat provides appropriate food and protection. Indeed, we found that sediment among prop roots had significantly more organic matter. Moreover, mangrove prop roots are usually covered with a rich fouling community, which can be a food source for sea stars (Scheibling and Metaxas 2010). Also, sea stars were less frequently damaged among mangroves than in seagrass and sand. The above allows the assumption that mangroves provide an abundance of food and reduced predation pressure for A. typicus. As they grew, juveniles migrated to adjacent habitats (seagrass and sand) which resulted in a density decrease in mangroves. Although the density stayed relatively the same over time in seagrass, it simultaneously increased in sandy habitats. Sea star radius was generally <40 mm in the shore habitats, whereas specimens were significantly larger on the shoal and had a mean R of 65 mm. Growth in enclosures showed that sea stars from the shore population could actually grow larger (40 < R < 60 mm), which also suggests that specimens of a certain size leave the shore and migrate somewhere else, for example to shoals. Janssen et al. (1984) observed specimens of A. typicus (R > 50 mm) to solely inhabit sandy patches at relatively low densities (4.1 individuals m−2). Similarly, we found that the density of large specimens (R ≥ 50 mm), exclusively found on the shoal, was lower (0.05 individuals m−2) than in all shore habitats. The relatively high densities along the shore may result in intra-specific competition for food and to avoid such competition, large specimens may migrate to offshore habitats. On the other hand, this migration could also be density dependent (and not food dependent), as was observed for the small brittle star Amphiura filiformis (Rosenberg et al. 1997). Whatever the cause, specimens of A. typicus with an R of 40 mm are able to move at a mean speed of ~0.5 m min−1 (Mueller et al. submitted), which would theoretically allow them to migrate to the shoal within 24 h.
Although at a much larger geographical scale, two different populations of another common Indo-Pacific sea star, Protoreaster nodosus, grew to different maximum sizes. In the Davao Gulf, P. nodosus had an R max of 140 mm (Bos et al. 2008b), whereas in Palau specimens reached an R max of 195 mm (Scheibling and Metaxas 2008). Densities were similar in these populations and did not explain the size difference. One of the possible explanations, however, was a difference in predation (Bos et al. 2008c). Sea stars use most of their energy for repairing damaged body parts, which sharply reduces overall growth and as a consequence their size (Diaz-Guisado et al. 2006; Barker and Scheibling 2008). Along the shore of Samal Island, specimens of A. typicus had a higher percentage of ray damage than on the shoal, which may have been the result of greater exposure to predation. Crabs of several species, potential sea star predators (Ramsay et al. 2000), were observed along the shore, whereas they were rarely seen on the shoal (pers. observation). Also, predation by fish, especially during high tides, may play a role. An intertidal brittle star in Kenyan reef flats mainly fed during low and incoming tides and hid in crevices during high tides avoiding predation by fish (Oak and Scheibling 2006). Moreover, the burrowing behavior of A. typicus during high tides may be a strategy to avoid such predation. Although other predators may play a role in offshore habitats (e.g. Bos et al. 2008c; Gaymer and Himmelman 2008), predation could have had a negative impact on the growth of small specimens in the shore habitats. Juvenile cohorts of Archaster typicus were observed between August and November, in both 2008 and 2009. From these data, we conclude that reproduction of A. typicus in the Davao Gulf is seasonal. Janssen (1991) earlier concluded that in the Philippines, A. typicus reproduces without a specific reproductive season after observing mounted sea stars in April and in November. We found single mating pairs in several months of the year, but only observed increased numbers of pairs in September and October 2008 (pers. observation). Although mating may occur throughout the year, the majority of sea stars must have synchronized their reproductive activity to produce the juvenile cohorts we observed. Modal progression analysis identified three juvenile cohorts in 2008. The first two cohorts were found before we observed mating and may have originated from a different source population. The third cohort, however, which strongly dominated the size-frequency distributions from November onward, may have been the result of mating in September and October. The expectation of observing juveniles 1 month after mating seems reasonable, because the larval period of A. typicus lasts ~30 days (McEdward and Janies 1993). In Taiwan and Japan, A. typicus reproduces between March and August (Mukai et al. 1986; Run et al. 1988), which confirms that mating may take place earlier in the year. Combining results, we conclude that reproduction of A. typicus in the Davao Gulf takes place between June and October. Sea star growth in the natural population was relatively similar to the growth of enclosed specimens. However, in the enclosures, growth of juveniles was strongly inhibited from October 2008 to March 2009. This difference may have been the result of exposure to different water temperatures. The natural population was exposed to high water temperatures in tide pools (e.g. 37°C in March 2009), whereas in the enclosures, water temperature hardly fluctuated with the tide. Moreover, shading in the containers (within the enclosures) may have lowered water temperature and have negatively affected growth rates of small juveniles. Archaster typicus is one of the target sea stars for the international ornamental trade, and some local populations in the Philippines are subject to intense harvesting (Bos et al. 2008a). To manage exploited populations, there is a need for information about habitat associations of the different life-stages and the population dynamics of the species. Our data provide a solid basis for future management, because we studied a natural population that has not been affected by collection. We thank I. Ebol, C. Ganadores, E. Glimada, S. Nitza, S.A. Nitza, D. Padrogane, C. Petiluna, F. Salac, J. Salinas, and I. Santamaria for supporting field and laboratory work. We greatly acknowledge A. Sales and D. Speckmaier from the Department of Science and Technology in Davao City, who organized the combustion of sediment samples. Also we thank the personnel of the Department of Environment and Natural Resources (Region XI) and the LGUs in Samal Island for their continued support. Two anonymous reviewers and S. Burton are acknowledged for their comments on an earlier version of this manuscript. The performed experiments complied with the current laws of the Republic of the Philippines.